In 1975 seven film and videomakers in their early 20s came together to document the seminal Punk Rock music scene at CBGB, the iconic music venue in New York City. They had all met while working at Manhattan Cable TV's Public Access department, where community members could get free training in video production, borrow equipment and schedule their programs for broadcast. In 1972 the FCC had mandated that cable TV systems in the top 100 markets provide public access, and by 1975 MCTV had become a major hub for video experimentation, the YouTube of its day. 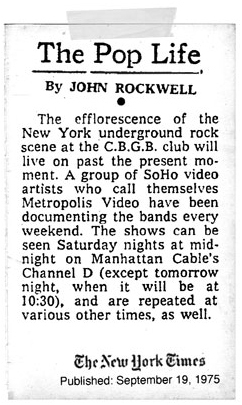 After convincing CBGB's owner Hilly Kristal to let them shoot a group of unrecorded bands who were performing there, the members of Metropolis Video descended into the chaos and grime of the former biker bar with a multi-camera, live-switched, live mixed audio/video system using the then revolutionary and inexpensive 1/2" helical scan video technology. Over several weekends from August through December of '75 they documented some of the best emerging bands, including Talking Heads, Blondie and the Heartbreakers. And, against all odds, Metropolis somehow managed to produce some of the earliest high quality sync-sound footage of the emerging New York Punk Rock music scene that exists today.